I am a big fan of Canadian interior design duo Sarah Richardson and Tommy Smythe. On their newest HGTV series "Sarah's Rental Cottage" they found a beautiful white and yellow quilt in an antique shop. I could only catch glimpses of the quilt on the show and never saw the whole thing but this is what I imagine it looked like. "Rental Cottage Quilt" designed, pieced and quilted by Anita LaHay of Daydreams of Quilts. I designed a quilt based on the few glimpses I could see of the one of the show. I have written a pattern for the quilt which I am calling "Rental Cottage Quilt." It is available now in my Payhip, Etsy and Craftsy shops. I used Briar Rose for the backing fabric. The sun peeked out today so you can get a better idea of the colour in the quilt. The cloudy shots are better for showing the quilting. This quilt is 65" x 77" so it is nice as a throw or for a twin bed. I quilted it with Aurifil White #2024 and Yellow #2105 both in 50 weight. The yellow was used for the stippling on the yellow snowball variation blocks and sewing down the binding. The white was used to quilt huge feathers travelling diagonally across the quilt. 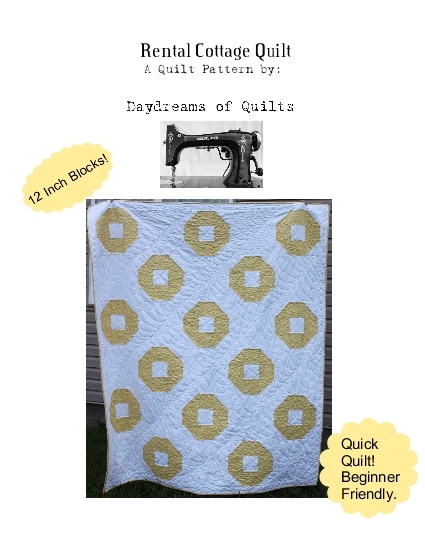 "Rental Cottage Quilt" pattern is now available on Payhip, Craftsy and Etsy. There's still time to enter my 4 year Blogiversary Giveaways. Click Here. I worked really hard to finish this quilt and pattern by Friday so I am linking up with TGIFF (button in sidebar) and Finish It Up Friday.